Order one for each VA office and location to be fully compliant. 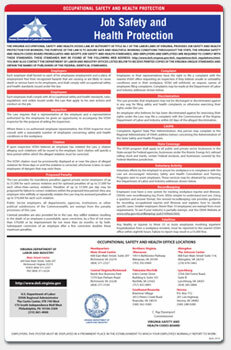 The VOSH poster is included on the Virginia Complete Labor Law Poster. When you order the Virginia Complete Labor Law Poster, it will satisfy your State, Federal, and OSHA posting requirements with one poster. 03/2019 - Earned Income Tax Credit - Poster revised with new EITC income threshold as well as a vastly expanded section on who qualifies for EITC and how to claim. 08/2018 - Job Safety and Health Protection - Updated with new penalty rates, and a new revision date. 09/2017 - OSHA - Updated with new penalty amounts for violations. 01/2019 - Occupational Safety and Health Protection - Minor clerical change to underline/bold a web address and provide a direct citation for the fine adjustment. 07/2016 - Job Safety and Health Protection - Update to VA OSHA poster, revision includes new reporting fatality reporting guideline and minor verbiage changes. 06/2015 - Unemployment Insurance - Update to Unemployment Insurance poster. Revision includes; new website, telephone number and content reformatting. 04/2015 - Occupational Safety and Health Protection - Minor revisions include a revised website listing, telephone and address changes, and a new commissioner. Many industries such as the restaurant, retail, construction, and professional use the Virginia Complete Labor Law Poster to satisfy their compliance requirements for State, Federal, and OSHA. When posted in an area frequented by employees, the Virginia Complete Labor Law Poster puts a business in full compliance. Federal contractors and subcontractors are required to display more postings in addition to the general State, Federal, and OSHA regulations. Please click here to see the federal contractor and subcontractor posting requirements. Ensure your full compliance by posting the Virginia Complete Labor Law Posters with the federal contractor-required postings.